The 4.5-acre-parcel is being developed for sale to individual purchasers interested in locating some type of business on the property, according to the rezone narrative. The concept plan submitted with the rezone shows what is being called a “quality” restaurant and a hotel on the site. Ken Beall, who represents the developer of the property at the Mars Hill Road, Daniells Bridge Road, Oconee Connector intersection, told the Development Review Committee on Friday that uncertainty about the improvements to that intersection is holding up the project. Widening of the Connector, Mars Hill Road, and the initial section of Daniells Bridge Road isn’t scheduled to be completed until May of 2018. The county rezoned the property between the QuikTrip and the proposed site for the hotel and restaurant in early August. The Barber Creek Fire Station currently sits on the site, but the county plans to move the Fire Station and sell the 2-acre property for development. At the time of the rezone, the county set some conditions on use of the property, suggesting that a hotel was a possible future use. 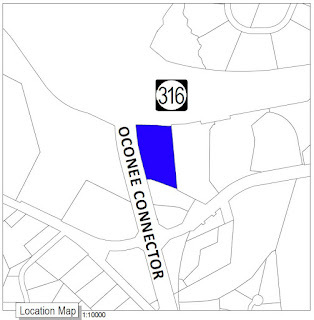 The 6.3 acres to the east of the fire station is owned by Oconee Hospitality Group LLC, and a SpringHill Suites hotel occupies roughly half of that 6.3 acres. The 4.5-acre tract being considered for a rezone tomorrow night is owned by 316 Holding Group, in care of James J. McDonald Jr., of Athens. 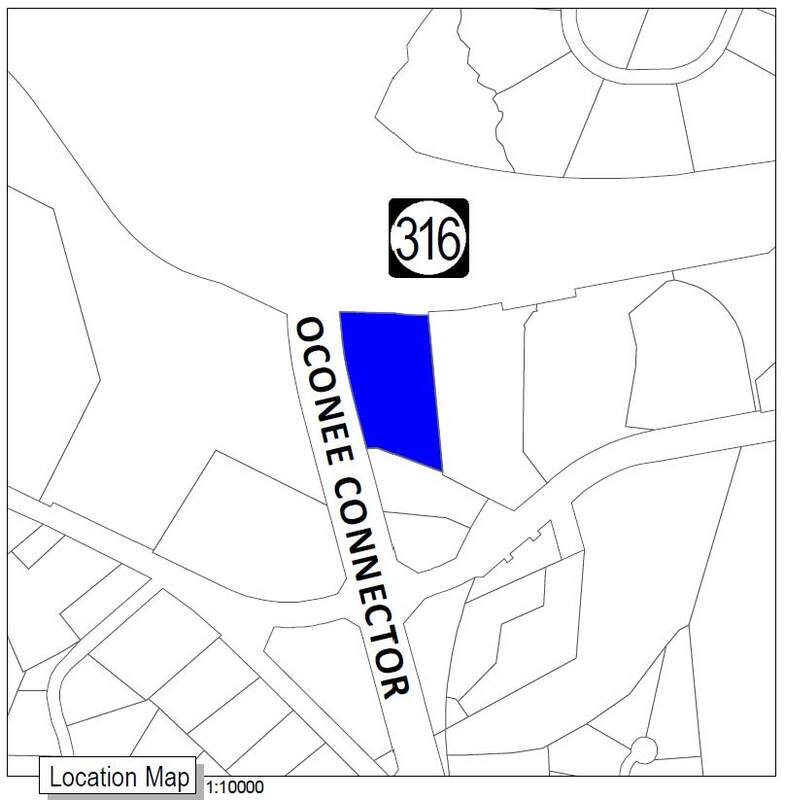 The concept plan submitted with the rezone shows the 4.5-acre parcel and the 2 acres owned by the county sharing a single access to the Oconee Connector. A median break would allow left-turns in for southbound traffic on the Connector, as well as right turns in and out for northbound traffic. The 4.5-acre tract currently is zoned for General Business, Planned Unit Development, but 316 Holding Group is seeking a Highway Business classification. The rezone narrative says that the project will have multiple buildings with various floor areas totaling no more than 125,000 square feet of space. Buildings are to be constructed in phases, the narrative states. Probable water demand, according to the request, is being calculated based on a 100-room hotel and a 200-seat restaurant. The project will require the allocation of sewer capacity from the county. The property will have no direct access to SR 316. The Planning Commission meeting starts at 7 p.m. at the Courthouse in Watkinsville. The preliminary site plans approved by the DRC on Friday are for a First Madison Bank And Trust building with a drive-through operation. 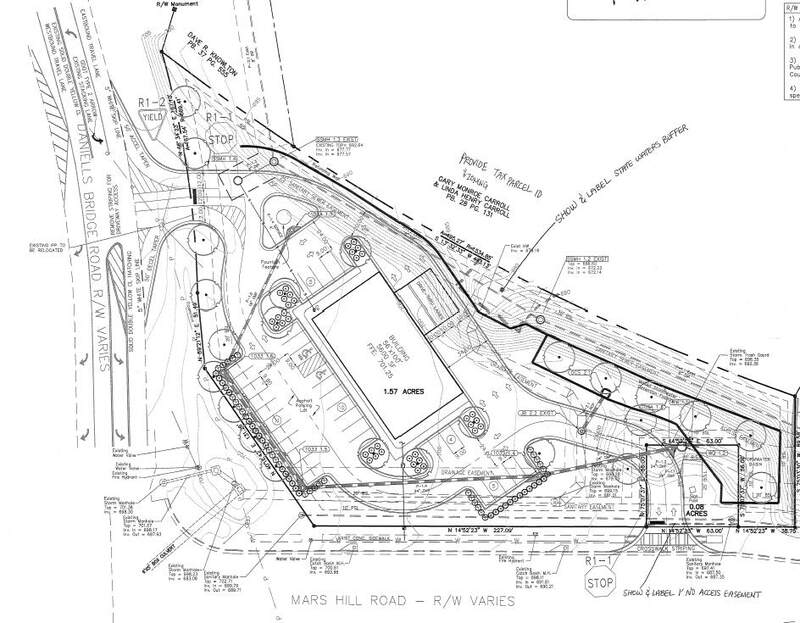 The plans show entrances both off Mars Hill Road and off Daniells Bridge Road. Beall told the Committee that the access has been approved as part of an agreement signed in 2000 between the county and his client, JJMB LLC and A. Paul Keller Jr. The difficulty, Beall said, is that he has not been able to see final documents from the state on details of the widening of Daniells Bridge Road at the intersection. The plans show a 5,600-square-foot building facing into the intersection of Daniells Bridge Road and Mars Hill Road. The facilty would have 35 parking spaces, and the drive-through operation would be on the Daniells Bridge Road side of the building. Sandy Weinel, assistant director of the Oconee County Planning and Code Enforcement Department, told Beall that his preliminary site plans did not meet county requirements in terms of tree planting. Beall said the problem was that there wasn’t enough space for the required trees because of the large number of easements on the property, including for water, sewer and storm sewer. Beall said the property is under contract, and while he could provide no timetable for construction, he said he expects the project to go forward. The DRC, made up of representatives of county departments involved in development issues, approved the preliminary site plans on the condition that the tree-planting requirements be addressed. The DRC also approved the preliminary plat for Stonewood, a 124-acre subdivision on Union Church Road, and reviewed construction plans for Malcom Bridge Estates, a 100-acre subdivsion on Malcom Bridge Road. Both of these were dormant subdivisions approved earlier that are coming back to life as homebuilding has rebounded in the county. The video below is of the entire meeting of the DRC, held in the conference room of the Government Annex on the south side of Watkinsville. Discussion of the First Madison Bank And Trust project at Daniells Bridge Road and Mars Hill Road begins at 1:00 in the video below. OCO: DRC 9 15 17 from Lee Becker on Vimeo. Even though Sheriff Berry was against it, Ken Beall was one of those responsible for the two new fast food restaurants being built across the street from one of the busiest spots in Oconee, the entrance to Oconee Primary, Elementary & Middle Schools. A ridiculous, reckless, unacceptable, inexcusable location, in an area already inundated with fast food/fast casual eateries. The Commission recommended in a 9 to 1 vote against the rezone for the fast food restaurants and approved by the same vote the rezone for a small shopping center tucked in the northwest corner of the busy intersection of Hog Mountain Road and U.S. 441. Beall didn’t identify the company or restaurants, but a representation of one of the buildings he provided showed a Bojangles chicken and biscuit store. The Commissioners expressed concern for the increased traffic across from the schools and the implications for traffic flow, particularly in the morning as parents drop their children off at the two schools. The area already has a number of fast food restaurants, and the Commissioners were convinced it doesn’t need any more. The Oconee County Planning Department staff report listed 3,492 Average Daily Trips resulting from the rezone. 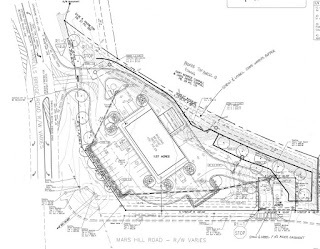 The concept plan shows an entrance directly on Hog Mountain Road and a connection to the existing entrance for the small strip center to the east of the restaurants, but Beall said the state ultimately would determine access to Hog Mountain Road, which at that point is a state route. How do all the requests for sewage fit with the problem of inadequate infrastructure in regard to sewage treatment capability? Are the planners ignoring this problem or have they solved it? How can some "dormant" developments move forward while others are stopped? Neither of the two residential developments that was before the DRC on Friday was a Master Planned Development requiring residential sewer capacity. The BOC has bought back the residential capacity allocated to the largest MPDs. Anonymous 12:30 pm - what you are referencing has nothing to do with the rezone referenced in this article. It seems all you want to do is bad mouth Ken Beall, what are you al competing Land Planner? Also, what were the landowners across the street from the schools suppose to do just leave their land undeveloped even though there are businesses right beside it? It's entirely possible they owned that land prior to all the schools being built, so in essence you are saying if schools are built it takes away the rights of the other landowners, but I do not remember getting a vote on where the schools are to be built. Anon at 2:12 PM. I totally agree with you on your assessment on the matter of bad mouthing Ken Beall. Land owners have every right to sell their property to fast food companies. Last time I looked, this was still the land of the free, and capitalism is still the way to the American dream in my opinion.